A legal tussle between Fall River, Massachusetts' Lizzie Borden Bed & Breakfast/Museum and Salem's True Story of Lizzie Borden Gift Shop and Museum has been settled outside Federal court. The owner of the Salem Museum has agreed to slash Lizzie's name from the business name and website domain, but he retains the right to use "Lizzie" in a tagline. If, I have it right. Perhaps the fight was almost as much about where the story should be told. Imagine a Villisca axe murder museum opening in Mason City, or Villisca true crime bed and boo-fest in Bettendorf. 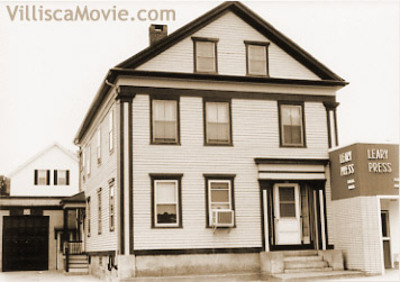 The now-vintage photo above was taken in 1994 when we spent two weekends in Fall River filming (in the specific and not generic sense on 16mm film!) a segment on the famous Borden murders for our documentary Villisca: Living with a Mystery. Don't you love that window air-conditioner? As we set up our camera outside Maplecroft, the owner approached and invited us in! Another story for another time. Meant to compare and contrast the community response to violent crimes in Villisca and Fall River, we ultimately cut the segment from our final film. The Borden chapter, in rough-cut form, is included among the DVDs special features. It features interviews with Michael Martin, Ken Souza, and Ed Thibault. Read about the "connection" between the 1912 Villisca ax murders and the 1892 Borden crime HERE. More details on the to and fro of Lizzie's latest legal woes below.